Doka UK, January 22, 2018.- Skyscrapers are one of the most suggestive constructions. Authentic challenges for engineering, execution and safety always attract the attention of construction professionals. A 200-meter skyscraper seemed a significant culmination a few years ago. However, there are already projects that multiply this figure by five. Something unimaginable in the twentieth century, but by the year 2045 some commentators are expecting the first mile-high skyscraper, a dream, a utopia, we’ll see. In the construction of skyscrapers, you need competitive solutions to make them a reality. And in this, Doka has much to contribute after decades of innovation. In this article we take a look into the tall buildings of 2017, reviewed by The Council on Tall Buildings and Urban Habitat (CTBUH). According to the 2017 Tall Building Year in Review, the annual report from The Council on Tall Buildings and Urban Habitat (CTBUH), reported a record-breaking 144 buildings of 200 meters tall (656 feet tall) or higher completed in 2017, led by the 599-meter-tall Ping An Finance Center and 555-meter-tall Lotte World Tower. In the report, CTBUH outline this year’s trends in tall building design. Notably, 2017 proved to be the most geographically diverse year in history for tall buildings, with 69 cities across 23 countries completing new towers, a significant increase from 54 cities and 18 countries in 2016. 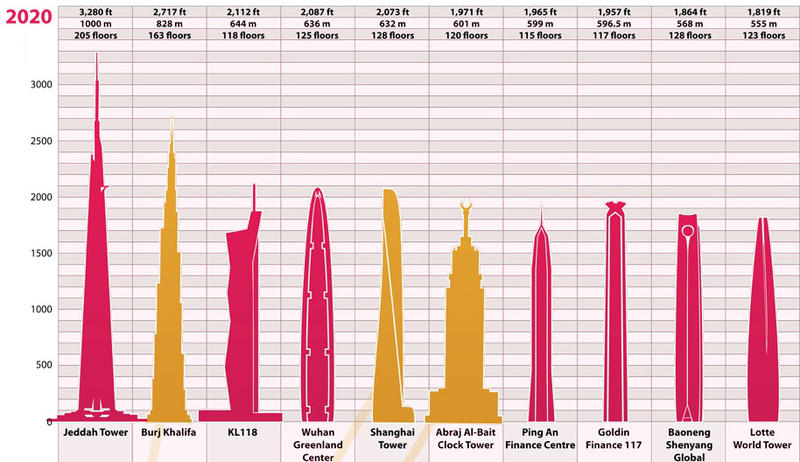 Of those numbers, 28 cities and 8 countries completed their new tallest building. The development of Jeddah Tower seeks to bring great changes in terms of development and tourism to the city of Jeddah, which is considered the most liberal city in Saudi Arabia. Initially planned to be 1.6 km (1 mile) high, the geology of the area proved unsuitable for a tower of that height. The design, created by American architect Adrian Smith, who also designed Burj Khalifa, incorporated many unique structural and aesthetic features. As of 24 August 2017, the project had already involved over a million hours of work, with 170,000 cubic meters (6,003,493 cubic ft) of soil removed for the foundations. Some 211,200 tons of concrete had been poured and over 145 concrete piles had been laid at depths of over 72 m (236 ft), to ensure the stability of the structure. The tower now stands over 200m tall. In the course of 40 years and more, Doka has made itself one of the world’s leading experts in formwork solutions for building high-rise structures, so it is no surprise that they have provided formwork solutions to help in the construction of this masterpiece, using self-climbing systems such as SKE50 Plus, amongst other systems. The construction of high-rise buildings has changed radically over the decades. Nowadays, it poses enormous challenges for project owners and structural engineers. No matter how stringent the requirements are, the Doka specialists invariably come up with innovative solutions that combine cost-effectiveness with ultra-high safety standards. 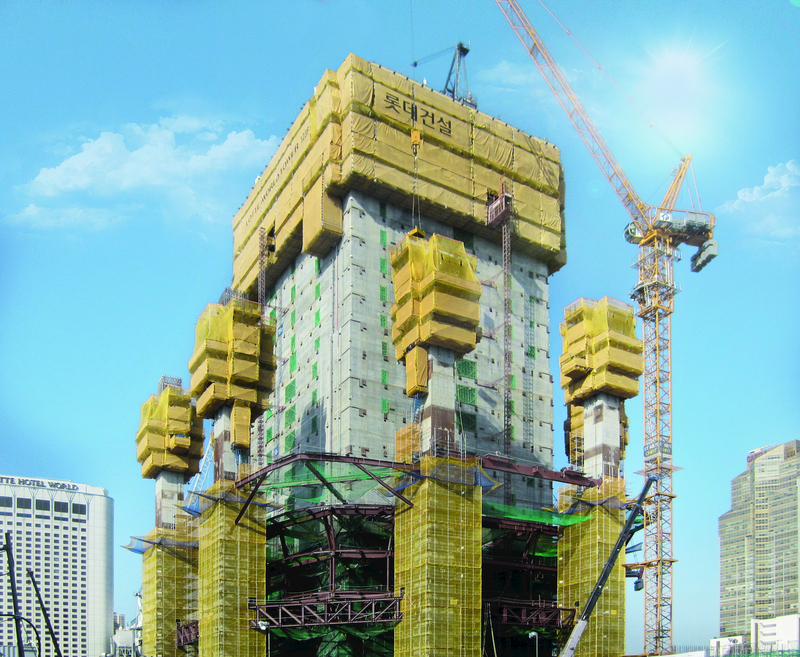 Last year saw Doka forming its 1,000th highrise. We now take a further look into a few of many major projects completed using Doka’s expertise across the globe. 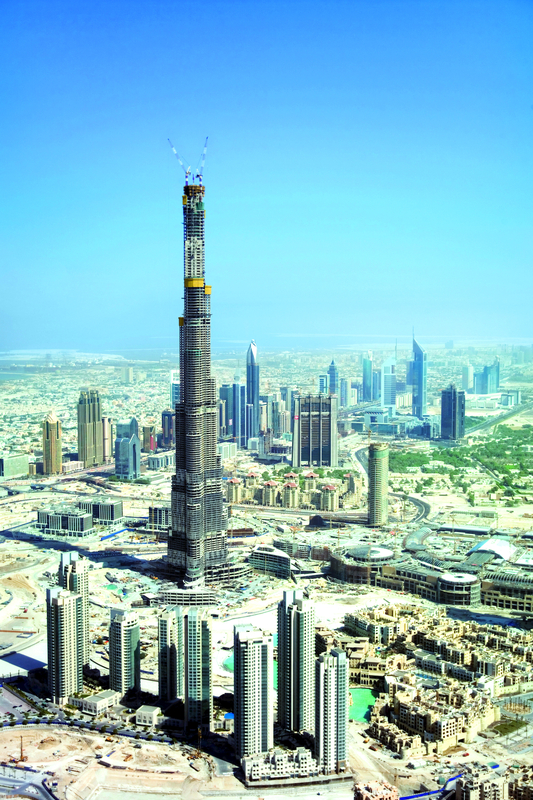 When it comes to ultra-challenging highrise projects like Burj Khalifa, the construction industry looks to formwork technology for innovative solutions that are designed for the very highest cost-efficiency and that meet stringent safety standards. The reason is that overall progress on all such projects depends crucially upon ‘Safe. Fast. Efficient’ construction of the CIP concrete core. Climbing formwork SKE is a tailor-made solution for formwork tasks like these. Doka climbing technology combines cost efficiency with high safety standards. This fact, plus their wealth of experience and planning capability gained over years in the industry, makes Doka The Formwork Experts for high-rise Projects. The megaproject standing at 830 m, is the world’s second tallest building and with Doka’s self-climbing formwork solution SKE, it took only 30 months to raise the 600m tall CIP concrete core. The Lotte World Tower is a project on a superlative scale. Standing at 123 storeys, the tower is house not only shops, offices and small apartments (known locally as ‘officetels’), but also a 7-star luxury hotel. The top ten storeys, with a viewing platform and café on the rooftop terrace, have be given over to public use. According to this megabuilding’s architects Kohn Pedersen Fox, the visual design of the gently tapered tower, with its uninterrupted curvature, was inspired by elements of traditional Korean ceramics, porcelain and calligraphy. The client, the Lotte Group, incorporated photovoltaic panels, wind turbines, exterior shading devices and rainwater harvesting systems into the building. “Elegance of form” was one of the prime objectives. The facade was cladded in light-toned silver glass accented by a filigree of white lacquered metal. The Doka formwork solution used SKE100 and SKE50 plus automatic climbers and the Protection screen Xclimb 60, to ensuring a swift and safe construction progress. In a formwork-engineering ‘first’, The Formwork Experts are using telescoping protection screens and platforms to deal with the structure’s continuous taper. 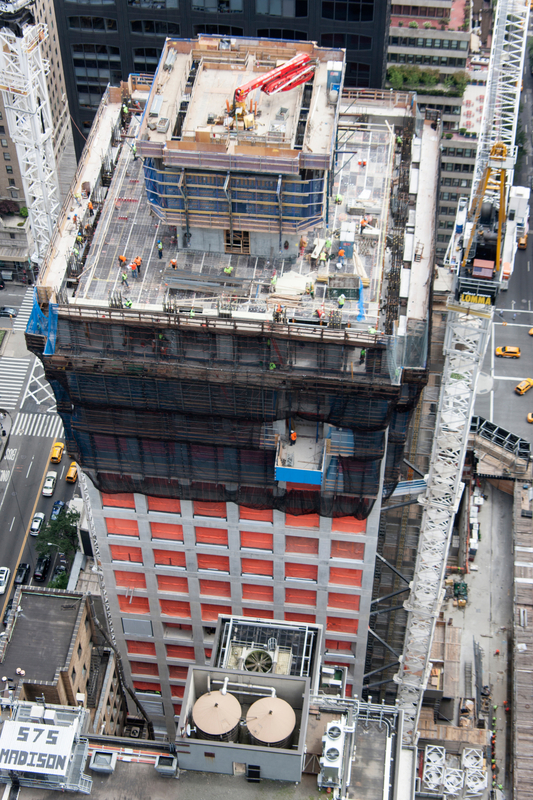 Doka, one of the leading formwork suppliers worldwide, delivered the formwork technology expertise for the building core as well as the façade of the high-rise Project, 432 Park Avenue. The tower which is located in close proximity to Central Park and now completed, boasts a height of 426 m. As a result, the skyscraper is not only the tallest residential building in the US but also in the entire western hemisphere. The building’s architecture is marked by lean proportions resulting from a square base of approx. 28 x 28 m that remain unchanged even with increasing height. Construction began in September 2011 and the project completed in 2016. In order to stay within the narrow time frame, Roger & Sons Concrete Inc., the building contractor, relied on Doka with its decades of international formwork expertise. According to various sources, there are plans to build an extraordinary one-mile-high (1,700 mtr) skyscraper in a Japanese ‘mega city’ being dubbed ‘Next Tokyo’. 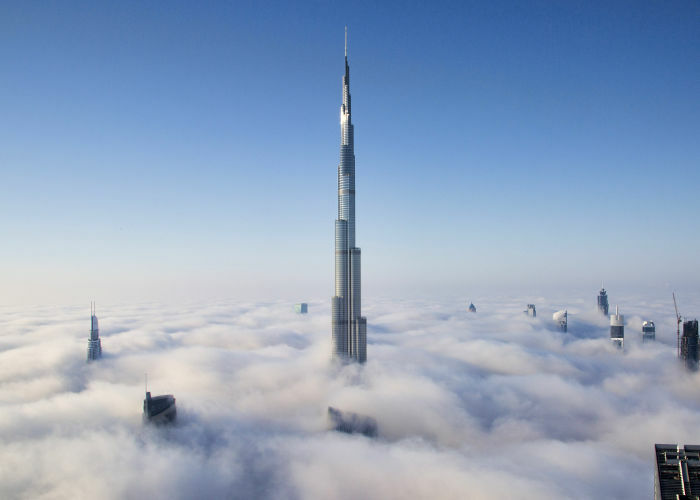 It would be more than twice the height of the tallest building in the world, the Burj Khalifa in Dubai. The structure known as the Sky Mile Tower would be the crowning centre piece in Next Tokyo, a futuristic city which is being built to combat climate change. The ‘mega skyscraper’ is expected to house 55,000 people who will have access to its ‘sky lobbies’ which will hold shopping centres, restaurants, hotels, gyms and even health clinics. It is being built in a hexagonal shape because the shape is the most wind resistant, Architectural Digest reported. Its elevators will not only carry people vertically from floor to floor, but horizontally to their apartments also. Architects developed a special way of distributing water to people one mile high up by creating a facade that collects, treats and stores water at different levels. Next Tokyo’s developers believe the sale of its waterfront properties could even hep pay for the project’s construction, if the proposal is approved. The city itself, expected to be completed by 2045, will house around 500,000 residents who are looking to leave their high-risk coastal homes and reduce their commute.